Have you noticed that more and more brands come up with entire textured collections? They’re everywhere! I don’t mind, I love them! Today I have Wish On A Starfish from China Glaze‘s Sea Goddess Collection to show you. 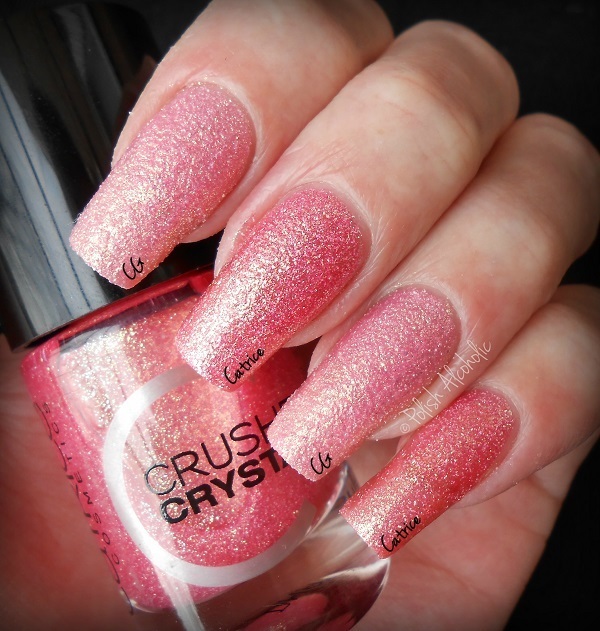 This is a pale pink with golden shimmer running throughout. I’ve used two coats for the picture below: It’s a pity that the golden shimmer doesn’t show up in my picture. It’s lovely! How does this compare to Catrice’s Call Me Princess? Wish On A Starfish is obviously a lighter shade of pink. Also I think the golden shimmer in Call Me Princess is slightly more noticeable than Wish On A Starfish. They’re both pretty! Formula wise they’re quite similar. They both need two coats for full opacity. Do you have a favorite textured polish? This entry was posted in China Glaze and tagged china glaze, china glaze sea goddess, china glaze wish on a starfish, comparison, dupe, pink, review, sea goddess collection, swatches, textured by Polish Alcoholic. Bookmark the permalink. I love this but I think of the three I’ve tried sea horsin around is my fav! I don’t have Sea Horsin Around (yet), it looks lovely! I think I like the Catrice one better but at first thought, I didn’t care, they’re similar and both gorgeous! I love that pinky golden sheen shade! The golden sheen is def stunning in both of them! Zo te zien heb ik die van Catrice ook nodig. Zit toch meer verschil tussen die twee dan ik dacht.